The vision for Providence Saint John’s South Campus Master Plan was developed by Moore Ruble Yudell Architects & Planners, in collaboration with Perkins Eastman, through a programmatic assessment process and within the framework of a Development Agreement established in 1998 between the City of Santa Monica and Saint John’s Health Center. The South Campus Master Plan creates a world-class Health Center and an integrated North and South campus. It replaces surface parking with thoughtful development and vibrant open spaces that will contribute positively to the City’s existing urban fabric. 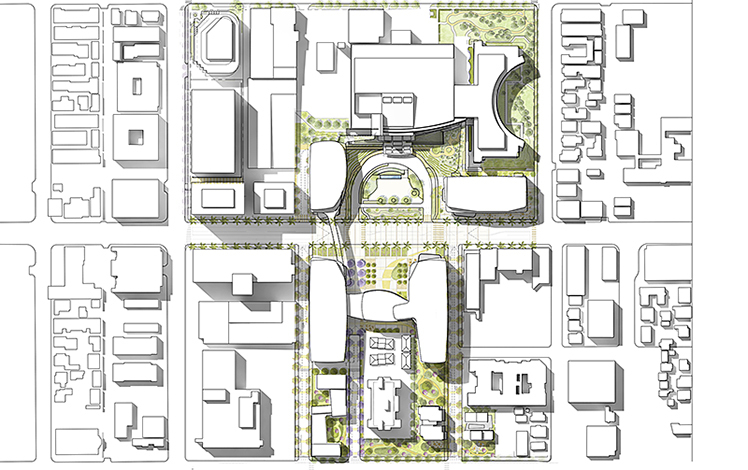 A major design concept establishes a pedestrian connection that initiates from the existing Mullin Plaza on the North Campus, across Santa Monica Boulevard to a new plaza, Saint John’s Square, on the South Campus, and then along an upgraded 21st Street “living street” that leads to a new South Garden along Broadway. A major goal of the South Campus development is to promote health and wellness programs, and other research and ambulatory services that can contribute to community health initiatives. A strong urbanistic approach was taken, integrated with Providence Saint John’s institutional and medical service needs, to create a setting that is both responsive to the Providence Saint John’s varied constituents, and also to the greater community of Santa Monica.